Good info, Amy. And I agree about the advance notice to the restaurant, of course. We always, email, call etc. Sometimes people can be mislead by a tweet from a PR person who says “come dine with us, we’re ready to serve allergic customers” only later to discover the CHEF did not stand behind this claim. I’ve also seen many errors and omissions on “allergen-friendly” menus. GREAT INFORMATION— SINCE WE ARE MEAT FREE– GLUTEN FREE– SUGAR FREE– & AS GMO FREE AS POSSIBLE– & NO TOXIC CHEMICALS– WE ARE MAINLY ONLY ABLE TO EAT OUR OWN COOKING—– BUT YOU PUT OUT GOOD INFORMATION!!!! Thank you for your ongoing support, Sonda! Another reader mentioned to try to use only organic and non-gmo oils, too. Just another way to try to stay healthy. Pingback: So Glad You Asked! What is Canola Oil? What a great idea the map is! I need to start doing this. I will check out your reviews on Yelp, too. Thanks for sharing. My gut tells me that researchers will eventually discover that a lot of us soy allergy folks also react to soy lecithin and soy oil. I’m sorry to hear about your husband. Just to clarify the ingredients labels should still state soy lecithin or soy oil–but they don’t have to list those as an allergen. Great posting! I am also highly allergic and agree that transparency is hard to find. I avoid soups at catered meals or in restaurants always b/c too often they have some sort of starchy filler– either flour or corn starch. I agree that oils are very scary. Did you know that some gourmet restaurants use peanut oil to fry french fries?– they say it makes for the best fries. BTW for egg allergic people, do you know that flu shots are incubated in eggs? Blessedly I keep kosher so at least I know that I can rely on the ingredient info because there is rigorous oversight. What scares me is genetic modification. I look everywhere for Non-GMO Certified Products. Thank you for this wonderful website and keep those postings coming! Thank you, Debby. I look for Kosher food all the time because of the safety! I did get an egg-free flu shot this year. First time my doctor asked which one I wanted–the egg free one or the regular. For oil sprayers, though, I really like the one I got from Pampered Chef. I keep it full of olive oil. It’s not quite as easy, and it needs to be pumped a few times to do a full baking pan or the whole crock pot, but I trust what’s in it (so long as I trust my olive oil, which I don’t always). I so wish someone up here would get the egg-free flu shot in! I had to explain to the nurse I talked to at my doctor’s office that there WERE, in fact, egg-free shots. She hadn’t heard of that and seemed mostly uninterested. The drug stores know of them, but don’t stock them yet. You had no issues with the preservatives at all? I understand that can be an issue for the corn-allergic. Great idea about the spray oil, Mary Kate. I have a few of those sitting in my pantry–they always get clogged for me! I’ve taught my husband to use olive oil on a paper towel to use on the outside grill instead of the spray bottles, too. Keeps the grill nicer as well as keeps me safe. Sorry about the eggless flu shots not being in your area. I haven’t noticed any reaction to corn from the shot. Knock on wood. Some years ago, we took my daughter out to a very expensive Mexican restaurant for her birthday. There were four of us in the party and the food was excellent. Unfortunately, she became violently ill. We had just become aware that she could not tolerate cotton seed oil. I had asked at the restaurant, before ordering if it was used. The reply was “No. They only used pure vegetable oil.” I called the restaurant later and asked again about any oil used. They were nice enough to read the label. It said vegetable/and or cottonseed oil. The front label said only ‘vegetable oil.’ Reading food labels on packaged cookies, cakes, and even some cereals I found the same thing. 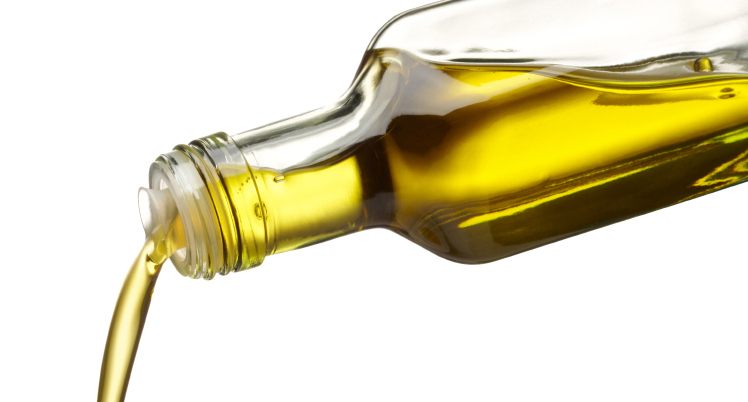 Labels on oils are very misleading and I have learned to ALWAYS turn to the back label for clarification. This is exactly why I wanted to write this blog post! So many restaurants do not know what is in vegetable oil, so they don’t know what they are cooking our food in, and then someone we love has a horrible life-threatening reaction. Thank you for sharing your story. Great post, Amy! The problem, though with asking about olive oil being 100% at restaurants is that (as you know) the companies themselves don’t even know it’s fake, or else turn a blind eye to it when it’s from other countries. For this reason I only trust California-made or USDA Organic olive oil. Obviously if you say this to the waiter or restaurant manager they will think you’re crazy so I always say I’m allergic to olive oil to save myself from an inadvertent reaction. On this same topic, I started a petition and was wondering if I may share here? Its to mandate labeling for ALL soy derivatives, including oils and GMO soy like natural flavors…. Thanks so much for sharing this petition, Maya. I will spread the word!